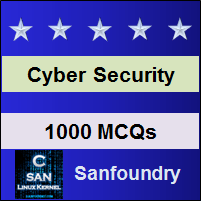 This set of Cyber Security Multiple Choice Questions & Answers (MCQs) focuses on “Hacking and Security Skills”. 1. An ethical hacker must need to have the skills of understanding the problem, networking knowledge and to know how the technology works. Explanation: An ethical hacker must need to have the skills of understanding the problem, networking knowledge and to know how the technology works. Password guessing and securing, network traffic sniffing, exploring for vulnerabilities are some other skills. 2. _________ persistence and up-to-date with the latest technological updates and their flaws are some of the major qualities; an ethical hacker must need to have. Explanation: High patience, persistence, perseverance, and up-to-date with the latest technological updates and their flaws are some of the major qualities, an ethical hacker must need to have. 3. ________________ enables a hacker to open a piece of program or application and re-build it with further features & capabilities. Explanation: Reverse engineering is the technique used to enable a hacker to open a piece of program or application (usually in a low-level language such as Assembly language) and re-build it with further features & capabilities. 4. Which of the following do not comes under the intangible skills of hackers? Explanation: Every hacker must possess some intangible skill-set such as creative thinking to process out a new way of penetrating a system, problem-solving skills as to cease down any active attack and persistence, try in different ways without losing hope. 5. Why programming language is important for ethical hackers and security professionals? Explanation: A programming language is important for hackers and security professionals to understand so that they can understand the working behaviour of any virus, ransomware, or other malware, or write their own defense code to solve a problem. Nowadays, security tools and malware are developed by security professionals with high skills and knowledge. 6. Understanding of ___________ is also important for gaining access to a system through networks. Explanation: A proper understanding of networking is very important for hackers who are trying to gain access to a system through networks. How TCP/IP works, how topologies are formed and what protocols are used for what purposes are some mandatory stuff a hacker or security professional must understand. 7. For hacking a database or accessing and manipulating data which of the following language the hacker must know? Explanation: For hacking a database or accessing and manipulating data, a hacker must need to have the knowledge of SQL (Structured Query Language). From a hacker’s perspective, if you’ve accessed any database for short period of time and want to change some specific data, you must need to write a proper SQL query to search for or implement your hack faster. 8. Information Gathering about the system or the person or about organization or network is not important. Explanation: Information Gathering about the system or the person or about organization or network is not important so that as a hacker one can get to know well about the target system or victim.